Just sitting around the house tonight w my dog. Felt like I should be doing something important, but couldn’t put my finger on it. That pretty much sums it up, doesn’t it? Well, it doesn’t end there. The hockey world is a polarizing place. Analysts and commentators alike will have you positing a single point of view, to either boost ratings or promote their brand. For those persons, Kessel’s tweet is literary gold. They’ll have you believe that Kessel is calling out all members of Team USA, from coaches to equipment managers. The eccentric Don Cherry is one of those persons. He was quoted in response to Kessel’s tweet in an article by Greg Wyshynski on the Puck Daddy blog on Yahoo Sports. I don’t understand it. Now you know why nobody wanted him in Boston, why he didn’t make the all-star team and why they got rid of him in Toronto. You just don’t do those things when guys are down. Kessel’s quote is pointed. It’s aimed directly at those men who might have put him in his house that night instead of offering him a way to contribute to Team USA. His position is fairly sound considering that he’s been one of the best scoring wingers in the NHL over the course of his career. While Team USA struggled to score goals throughout the tournament, the player who’s amassed 88 goals and collected exactly 200 points over the last three seasons, sat at home and watched it all unfold on his TV. Those comments don’t get lost in the fray and those comments are there and have been read and I think will be remembered when whatever happens going forward happens going forward. Whether that’s a subtle jab at Kessel as a player from an opposing team, or if it’s simply a scolding from a Team USA member, that’s not exactly clear. One thing that is clear is that it didn’t end with Backes. There were other Team USA members chiming in on Kessel’s tweet but none were more matter-of-fact than Derek Stepan, who is quoted in Luke Fox’s article at Sportsnet.ca. It would be disrespectful if it was directed at us. Backes was quoted a day prior to Kessel’s tweet in a Chicago Tribune article by Chris Kuc which foreshadowed Team USA’s decline. We’ve got a blue-collar team that works hard and has to stick to that to have success against them. If we get in a track meet, it favors them. If we get into a grind game and use our size and physicality, we might be able to tilt the scales in our direction. 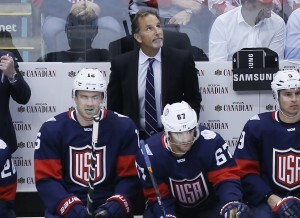 It helps prove the point that Team USA was a disaster from the outset. Anyone who’s watched ten minutes worth of Team USA hockey can tell you all about their collective problem. Grit and powerful players aren’t a matchup for the speed and skating that utterly dominates hockey around the globe right now. Kessel is a fast guy who works hard. Heck, his body of work throughout his career suggests that he’d be a no-brainer when it comes to him as a member of Team USA. But, alas, some things were not meant to be. Whether that has to do with his falling out in Toronto (which hosts the World Cup of Hockey) or his perceived skill set by head coach John Tortorella, we may never know for sure. We do know that Kessel’s tweet was appropriate considering the state of Team USA. We also know that Tortorella’s misguided coaching philosophies helped contribute to that state. We do know that emotions run high in the wake of an elimination game. What we don’t know is whether this will linger much longer. I’m betting that by the time the first puck is dropped on the 2016-17 regular season, this is largely forgotten. The Hockey Writers coverage of the World Cup of Hockey 2016 is being brought to you by PrimeSport, the official Fan Travel & Hospitality Package Partner of the World Cup of Hockey 2016.